Bringing together three of the most distinguished names on the contemporary jazz, Latin Jazz, and creative music scenes, the LPK Afro-Caribbean X-Trio is a venture of three long time friends and collaborators, now banding together in equal partnership after well past a decade of playing together in each other’s groups and with musical legends like Eddie Palmieri. These shared roots, along with their truly unparalleled range of collective experience and depth of creativity, result in original composed and improvised music of virtuosic intensity, deep feeling, and communicative joy. 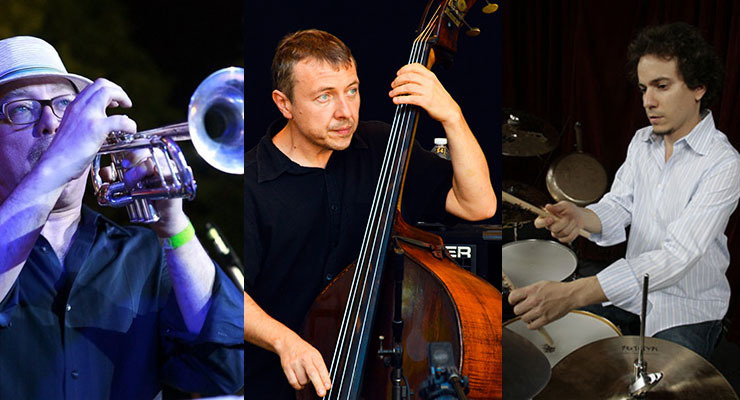 IN MIAMI: at The Frost School of Music, University of Miami on March 17thJoin Brian, Dafnis and Boris when they take the stage in New York and Miami to inaugurate what will doubtless be one of the most important new groups of 2014! this performance is part of Dafnis Prieto’s week long residency at the Frost School Of Music. Trumpeter and Grammy© Award Winner Brian Lynch brings to his music an unparalleled depth and breadth of experience. A honored graduate of two of the jazz world’s most distinguished academies, Art Blakey and the Jazz Messengers and the Horace Silver Quintet, he has received wide acclaim during his long tenures with Latin Jazz legend Eddie Palmieri and straight ahead master Phil Woods. He has also been a valued collaborator with jazz artists such as Benny Golson, Toshiko Akiyoshi, and Charles McPherson; Latin music icons as diverse as Hector LaVoe and Lila Downs; and pop luminaries such as Prince. As a bandleader and recording artist he has released over 20 critically acclaimed CDs featuring his distinctive composing and arranging, and toured the world with various ensembles reflecting the wide sweep of his music. He currently is Associate Professor of Studio Music and Jazz at the Frost School Of Music, University of Miami as well as conducting clinics and workshops at prestigious institutions of learning the world over. His talents have been recognized by top placing in the Downbeat Critics and Readers Polls (#3 Trumpet Critics Poll); highly rated reviews for his work in Downbeat, Jazziz and Jazz Times; 2005 and 2007 Grammy award nominations, and grants from the National Endowment for the Arts, Chamber Music America, and Meet The Composer. Brian’s most recent CD releases as a leader include the Downbeat 5 star rated Unsung Heroes project (Hollistic MusicWorks), ConClave Vol. 2 with his Spheres Of Influence group (CrissCross) the Grammy Award winning Simpático featuring Eddie Palmieri (Hollistic MusicWorks), and Bolero Nights For Billie Holiday (Venus). From Cuba, his arrival in the U.S. has been compared by to that of an asteroid hitting New York. Indeed, within a short period of time Dafnis Prieto’s revolutionary drumming techniques had a powerful impact on the Latin and Jazz music scene, locally and internationally. Various awards include “2011 MacArthur Fellowship Award”, “Up & Coming Musician of the Year” by the Jazz Journalists Association in 2006, a Grammy Award Nomination for ”Absolute Quintet” as Best Latin Jazz Album, and a Latin Grammy Nomination for “Best New Artist” in 2007. Also a gifted educator, Prieto has conducted numerous master classes, clinics, and workshops. Since 2005, he has been a member of the NYU Music Faculty. A resident of New York since 1999, he has already worked in bands led by Henry Threadgill, Steve Coleman, Eddie Palmieri, Chico and Arturo O’Farrill, Dave Samuels & The Caribbean Jazz Project, Jane Bunnett, D.D. Jackson, Edward Simon, Michel Camilo, Chucho Valdez, Claudia Acuña, Roy Hargrove, Don Byron and Andrew Hill, among others. He has performed at many national and international music festivals as a sideman and as bandleader including various of his own projects and music. Dafnis Prieto is the founder of the independent record company Dafnison Music. As a composer, he has created music for dance, film, chamber ensembles, and most notably for his own bands, ranging from duets to his “Small Big Band” and including the distinctively different groups featured by five acclaimed recordings as a leader: About The Monks, Absolute Quintet, Taking The Soul For a Walk, Si o Si Quartet- Live at Jazz Standard, and Dafnis Prieto Proverb Trio. He has received new works commissions, grants, and fellowships from Chamber Music America, Jazz at Lincoln Center, East Carolina University, and Meet the Composer. One of the most in demand bassists in modern jazz, Kozlov has proven himself to be a virtuoso with a unique voice. Since moving to New York from his native Moscow 20 years ago he has been a first call for acts like Mingus Dynasty, Michael Brecker, Ray Barretto and countless others. After playing acoustic and electric bass on more than 200 records (12 nominations and 2 Grammy’s) he continues to perform internationally making close to 250 live appearances a year while also being very active as part of the New York jazz scene.